morning breath, the coffins break / open. boy slips under the radar smooth / as skin & his face on / backwards. his own still / life reimagined on the battlefield: two players / at odds. boy shoots and the other cries / wolf for the master that goes to whip / his own son. in the sandbox, the shovel dark brown / the day dark / white but not / gray. here, boy with battle / hymn for daybreak, the wolves forget / to fear. when the shot stills his heart / when boy hangs / each lash his / executioner. boy learns a new / language this thing baptized divorce / called discipline / wears them on his own / sleeve; to the confessional to punish / the wrong hand. is this a sin / loving / the taste of skin, as if aliveness is something / to be fed. at birth boy’s mother crawling / towards him, the same way his father crawls / to beg back the bullet. boy remembers: how he skinned / the pistol until shining / struck the barrel against his knees / quivering. the wine that night thicker than water / loving a whipped / back as red as it is leaking. father captures a still / holds boy as first emerged / the rattle spilling / open like after a feasting, how blessed his skin / white as mother’s milk. I grow feathers instead of a beard. a little too soft. a little too white. the first one where the orange should be. where they are most soft. white glass. me & throat like a ladle, poached until white. his body roughshod against her thighs. sweeping in with their gelled teeth. closed was all rutting – gamed the meat into bite-sized bruises. NOEL PENG is a writer and musician from the Bay Area of California, currently serving as co-founder and manager at the Glass Kite Anthology. 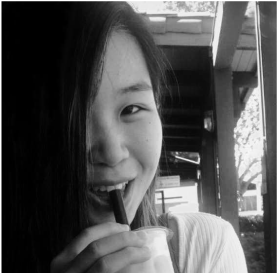 A 2014 California Arts Scholar and alumna of the Adroit Journal Mentorship Program and Winter Tangerine Review Summer Workshop, her work has appeared or is forthcoming in The Cadaverine, and The Best Teen Writing of 2016, among others. She is seventeen years old.